Novalon is a unique material that makes it possible for this unit to perform better compared to many of its similar counterparts. Apparently, this model is capable of providing you with up to two hundred percent better abrasion resistance than others. You’ll also get around 10% more resilience, as well as 10% better shrink performance. The unique heat-activation employed in this product makes it possible for it to be a great fit for a variety of users, be they women or men. Why’s that? Well, the simple explanation is that the material molds to the attributes of your feet. 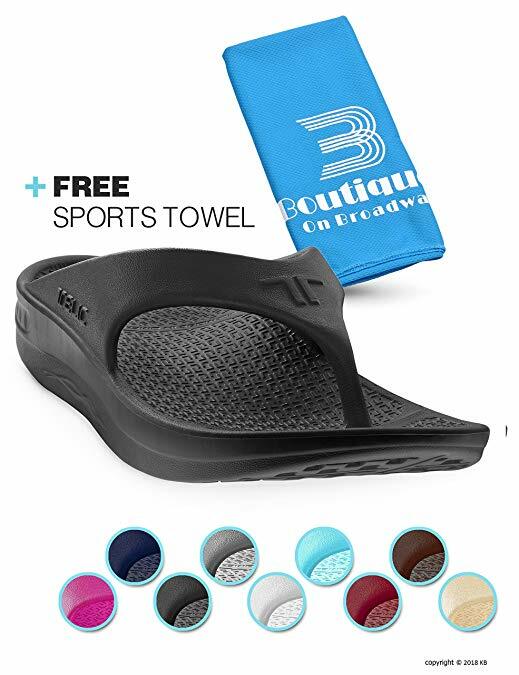 Aside from being a quality product in itself, this pair of comfort flip-flops is also worth considering because it comes accompanied by a sports towel, too. Moreover, the unit is backed by a satisfaction guarantee and based on the reviews garnered by the model, it appears that the brand will indeed go out of its way to provide refunds, returns, and replacements, if they are needed. Dealing with the pain of plantar fasciitis can be challenging, to say the least. We know how daunting it might be to look for the right comfort sandals or flip-flops, so at least it’s worth noting that this product is podiatrist-recommended. 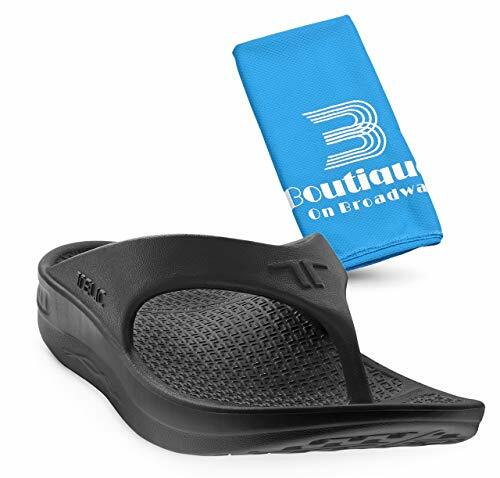 The flip-flops have a unique design, which combines a shock-absorbing material with soft arch support. What this means is that you’ll get all the benefits of a negative heel, as well as those ensured by a contoured footbed. Ergo, the pain will be considerably more easy to take. Even though they might not be the most expensive thing you’ll ever buy, you need to know that your flip-flops are going to last for a decent amount of time. Otherwise, you’ve invested your money in them for no reason. Since they’re made of 100% Novalon, these ones will both provide you with reliability over time and with abrasion resistance, as well as shrink performance. 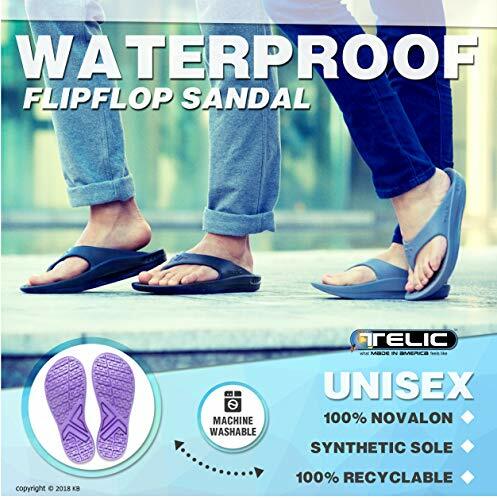 We’ve consulted some of the opinions expressed by people who have worn these flip-flops before, and we’ve reached the conclusion that they might be just what people with wide feet have been looking for. Those with narrow feet, on the other hand, are not recommended this product because they might find it both unsuitable and risky to wear. The amount of appreciation gathered by this unit is quite impressive, but there are some things that are worth mentioning. If your feet are too narrow, you might find these flip-flops unsafe, in that you may slip and unfortunately, sustain an injury. Read the reviews before placing your order because that’s the only way you’ll find out whether these are a good fit for you or not.